Experiencing historic maritime cities, where innovation meets the traditions of the past, plus the authenticity of iconic windmills and the floral masterpiece of the colourful bulbfields. Fly to Amsterdam from a variety of airports or take a late morning Eurostar from London St Pancras International changing trains in Brussels (you will be accompanied by your tour manager), to Amsterdam. Here you will be taken to the ship, where the dedicated crew welcome you on board, ensuring you settle into your luxurious cabin, and familiarise yourself with the ship. As dawn breaks, the scenic shoreline of Enkhuizen comes into view, nestling at the edge of the old Zuiderzee. During the 17th-century Golden Age, the Netherlands dominated world maritime trade, becoming fabulously prosperous and Enkhuizen, one of the country’s principal ports, was no exception. Merchants keen to spend their newly acquired wealth created the quaint town you see today, and in celebration of this illustrious past, one of the county’s best museums was created. The Zuiderzee Museum is a superb recreation of 19th-century local life, with actors in period costumes demonstrating essential skills of the time in an authentic setting. Experience a sail maker’s, fish smokehouse and blacksmith’s plus many other fascinating things. Explore this delightful town, taking in the atmosphere of its little streets and the colourful jumble of boats in the picturesque harbour. After lunch on board, cruise along the Markermeer, the southwestern part of the great IJsselmeer lagoon, created when the Zuiderzee dam was constructed, separating it from the North Sea. This mammoth engineering achievement reclaimed huge tracts of land using the unique Dutch talent for such projects, honed over hundreds of years of battling the mighty sea. Before long, thoughts turn to tonight’s excellent dinner in the ship’s restaurant, after which you unwind with a digestif at the bar to the soothing tones of the ship’s pianist. Wake this morning in historic Rotterdam, the Netherlands’ second largest metropolis with a strong maritime heritage, having been a major port since the 16th century. Literally the Gateway to Europe’, it is the largest European cargo port and the tenth largest in the world, due to its strategic location where the Rhine meets the North Sea. Barges are able to transport goods deep into the heart of Western Europe via a maze of inland waterways, whilst ocean liners export goods all over the world. Its logistical significance made it a prime target for aerial bombing during World War II and the city’s historic core was completely destroyed. Over the following decades the city was rebuilt and now boasts some of Europe’s most innovative and imaginative architecture, such as the pencil-shaped public library reminiscent of the Pompidou Centre in Paris, and the unusual cube houses built on stilts and tilted at bizarre angles. There is also an abundance of excellent museums, such as the renowned and vast Boijmans Van Beuningen, housing a world-class collection of Old Masters, and some rare and beautiful glassware. During lunch on board, enjoy a kaleidoscope of views through the panoramic windows as you leave the city skyline behind. A significant part of the Netherlands lies up to seven metres below sea level, but an innovative and intricate network of dikes and drainage systems keeps the ever-rising seawater from flooding the land, even during the spring tide. At the very heart of this fascinating reclaimed region is Kinderdijk, your next port of call. Here, you can witness a truly iconic polder scene – a series of nineteen authentic windmills lining the canal banks, set against a starkly beautiful backdrop of pancake-flat marshland. The earliest known windmills appeared in the 13th century; a century later they had evolved to include a series of gears, enabling them to pump water, and mass drainage of the land commenced. 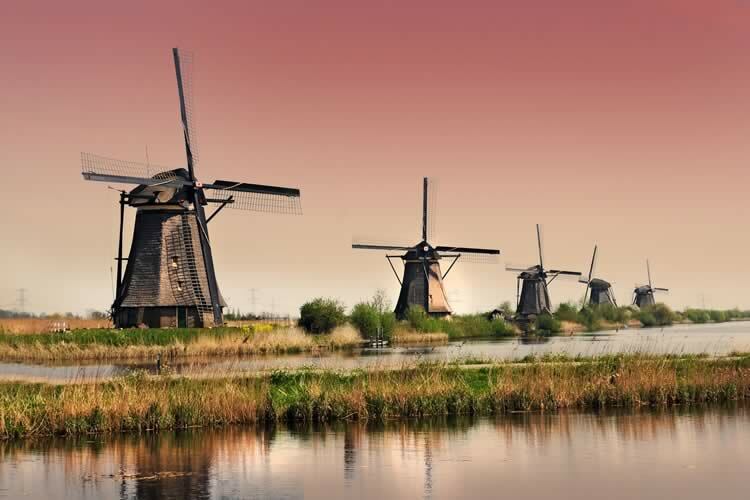 By the 19th century, the Netherlands’ 10,000 windmills were also being used for sawing wood, making potters’ clay and crushing pigments for paint, but the invention of the steam engine signalled their decline. By the end of the 20th century, there were less than a thousand still operating. Visit one of these beautifully preserved iconic windmills with a guide, learning more about their history before returning to the ship. Take a scenic drive through the heart of the magnificent bulb fields to the world-famous Keukenhof Gardens. Nothing quite prepares you for the dazzling array of colours stretched out before you, as the fertile coastal plain is illuminated by a natural display unrivalled anywhere else on the planet. At Keukenhof, the art of the flower garden reaches breathtaking heights, as you marvel at the dramatic pageant of hues amongst the myriad of blooms, set amidst a stunning landscape of shimmering lakes, ancient trees and water gardens spanning a staggering 80 acres. The wonderful variety in design, colour and scent gives each garden a unique character – a wealth of inspiration for your own little patch back home! Return to Amsterdam, truly one of the world’s most fascinating cities, where the classic glass topped canal cruisers take us on a sightseeing tour by this most appropriate of means! Get real insight into Amsterdam’s history, art and peoples that has been at the heart of European culture and commerce for many centuries. You will see a remarkable variety of sights: gabled roofed buildings along the picturesque canal-side waterfronts, outstanding museums, bridges immortalised by the great artists, and the homes of Old Masters like Rembrandt and of the heroine Anne Frank, the young Jewish girl whose diaries tell a poignant and extraordinary tale of life under the Nazis. We remain moored in this wonderful city so you might choose to discover the interior of Anne Frank’s house, or just wander where your feet take you. Amble along the picturesque canals and dodge locals astride their bicycles! For a spot of culture, visit the Rijksmuseum, a world-class art gallery with an astonishing collection of 5,000 remarkable works. Alternatively, you may prefer to simply relax at a canal side café, absorbing Amsterdam’s special atmosphere over a rich Dutch coffee, before returning to the ship for tonight’s very special Captain’s Dinner. This morning at the appropriate time, transfer to the train station or airport for your return journey. Return flights from the UK - regional airports/Eurostar are available but may carry a supplement. You can now purchase a drinks package, at a cost of £69 per person.